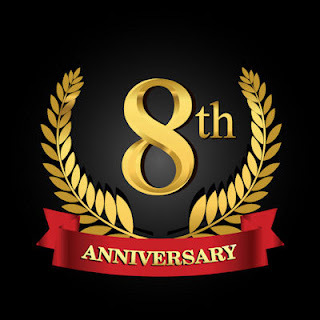 Outlandish Observations: Outlandish Observations is 8 years old! Eight years ago today, on August 28, 2008, I started Outlandish Observations! Special thanks to all of my followers on the Outlandish Observations Facebook page! Last year at this time I had 7,063 followers on Facebook. Today that number is 8,752, an increase of 23.9%! I'm amazed and delighted that so many new people have found my site in recent months. Welcome, and I hope you take some time to look around and see what else is available here. Look here for my recaps of all of the Season 1 episodes. Many, many thanks to all of you who've visited Outlandish Observations over the past eight years. It's been an amazing journey, and I'm so glad you've come along for the ride. Happy Birthday Outlandish Observations and Congratulations Karen!! Karen, I am most grateful for you watching over this site. I am not a techie person and depend on you sharing valuable information about Outlander's author, books, and series. It will be wonderful if you keep this unique site around for another 8 years. It is not as aggressive as the CompuServe site which has answered many of my questions, but seems to overpower me at times. Outlandish Observations is my go to place on a weekly basis. Thank you Karen for sharing and caring about Diana Gabaldon's fans for the last 8 years. Happy Anniversary! Thank you for your dedication to all things Outlander! Congratulations Karen on your great site and thank you for all your hard work! Much appreciated! Hi Karen < congratulations on your anniversary , I love your Blog and think it's one of the best around about and relation to all things Outlander , when I first became an Outlander Fan, there were so many Outlander Websites to choose from that it took awile to look them over and when I came across yours , I found it to be very informative and fun at the same time so I added it to my Facebook page and am so glad I did , so keep up the great work and Happy Anniversary to you , please post more soon. LOve Your Blog.